Author: Christopher Clark ~ Publisher: Kadon ~ (1-2P 8+) ~ Find It! The 10x10 grid of the Transpose board serves for several excellent games. In "Transpose," be the first to exit 8 checkers off the board, but watch out... some opposing pieces may switch places with yours! In "Peregrine," circumnavigate the board's perimeter to bring 5 checkers to the exit point; they can travel as stacks to advance more quickly, but also risk greater setbacks. In "Upper Hand," cover or capture all opponent pieces. 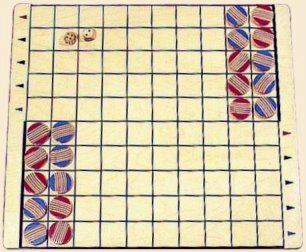 And in "Amazons," block in the opponent's four pieces with arrows: where an arrow lands no move can cross, and each turn adds another block to the board. Four other good games, plus some solitaires, are included.